New this year — Brussels Stalk Photo Contest! See Nuts and Bolts. And remember to guess the weight of the Blue Hubbard Squash! Pickup is This Thursday, November 13 from 10 – 6:00. Greetings Friends! Thank you for stepping into the winter trek by taking home this year’s storage share! 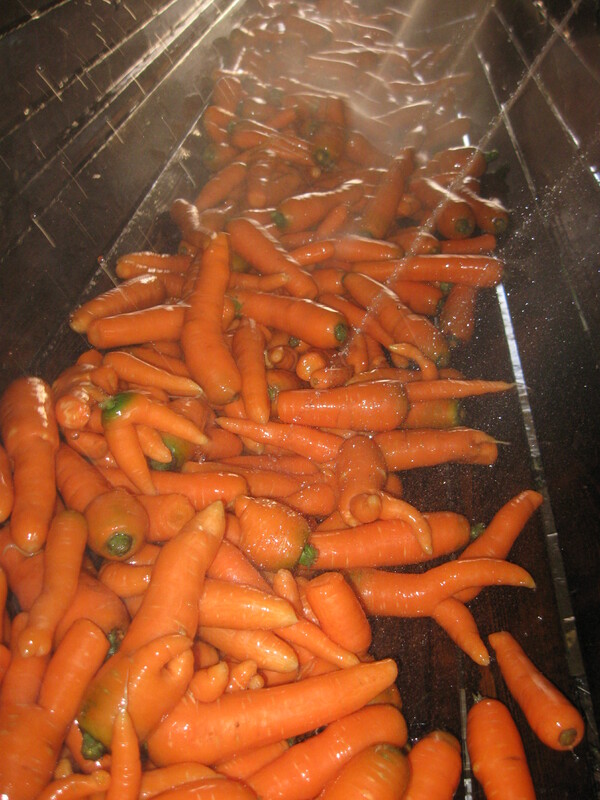 We love harvesting and prepping food in these colder months. We got all the picking done last week, thankfully (except the kale), since this storm / cold front sure would have made that more difficult. Last week’s mild temps made picking and finishing up in the fields pretty easy and fun. Like a lot of other people before the storm, we have had to scramble to get tractors, equipment and random piles of stuff put inside or out of the way just in case this snow is here to stay. But now it’s done, faster than it usually is! This early start to winter is a reminder that our northern growing and farm-fresh-eating season is so short, and it feels good to make it a little longer for all of us with big piles of hearty, yummy veggies. The work provides us with a last blast of soil, color and freshness before the depths of winter. Bright orange carrots and dark green kale, of all the beautiful things you’ll get this week, year after year these two bring more smiles to our faces than any other part of the farm at this time. Well, squash comes pretty close, as we roast a handful every weekend and enjoy them all week — pulling that pan full of different shades of vibrant orange out of the fridge makes the sun shine on a cloudy day. Seems like we just barely stopped picking since the regular share pickups ended less than a couple weeks ago….we’ve hauled in thousands of pounds of food since then, most of which will leave the farm with you on Thursday. The barn is brimming with root crops and cabbage and garlic. The 2,000 or so pounds of winter squash are cleaned and staying warm in the greenhouse, along with the onions, and the potatoes are bagged and ready to go, waiting in the basement. The hardy crops that we had been leaving in the field have been getting sweeter and sweeter — kale, brussels sprouts and leeks — but now with this forecasted snow and frigid cold front the only thing left out there is the kale. We harvested the sprouts and leeks already, just to be safe. We are definitely bundled up as we wash and wash some more, getting things ready for Thursday. As we harvest and store this year’s final harvests, we’re thinking about next year and how this will all work with the new root cellar. It will be a new dance then, with the major change being more volume of roots, less lifting and carrying by hand, and the new storage area to learn how to use. We also keep thinking about what it would take for us to turn the storage share into a winter share, with 4 pickups, once a month November through February. That is still very much a thought-work in progress, and we are still on the fence about it. So far we can see it would take a little more storage construction, and an increase in the price. You taking all this food off our hands this week helps keep this storage share price low, so we’d have to make sure we pay ourselves appropriately. It would be fun though — to see you through the winter, to keep you supplied longer, to make it work for more people. Oh, the future….can anyone see it? Potatoes — 9 lbs — The variety is Kennebec, which stores well and is a good all-purpose spud. We aim to have ten pounds for everyone but we had to cull a bunch of the harvest due to “greening” in the field. This keeps happening, so we are looking for another variety to grow instead, if you have recommendations or requests let us know. We like a potato that’s good for late harvest and long storage. Note: Kennebec is also prone to greening in storage, so be sure they are kept in a completely dark place. Easy Storage Tip: Dark, cooler than room temp, but not in fridge. Mixed Roots — 10 lbs — You get to mix and match a bag of beets, parsnips, celeriac, radishes, purple carrots, and maybe another surprise or two. We may need a limit on parsnips due to low yields, but there’s plenty of everything else. We’ll have those same perforated bags you can put them in for long-term storage. Easy Storage Tip: Fridge. Winter Squash — 5 — Butternut plus a few small pie pumpkins, ambercups and buttercups available. We also still have a few acorns and carnivals, though the flavor on these remainders has been hit-or-miss — but might be worth a shot if you love them. The butternut should keep very well into January, declining after that. The others are best eaten within a couple weeks. Easy Storage Tip: Countertop or tabletop, but for longest storage put a few in the basement or cool closet. Brussels Sprouts — 2 stalks –Try them you’ll like them! These grew well and have been through some good cold weather, so the flavor is mild and sweet. We leave them on the stalk since it takes so much labor to cut them off (and maybe it’s interesting for you to see how they grow)–thank you for dealing with the stalk! We hear it makes a great hose for a firefighter costume, or magic wand, the sky’s the limit apparently. Send us a picture of your favorite brussels stalk re-use for our Brussels Stalk Photo Contest! Easy Storage Tip: Fridge, in plastic bag on or off the stalk, for 1-2 weeks. Cabbage — 2 — Easy Storage Tip: Fridge. Leeks — 3 or 4 — Depends on yields, we’ll count this week. They’re also a little smaller than usual due to a disease issue, but are fine for eating and storing. Think of leeks like mild, glamorous onions. Our favorite use is in quiche, with red peppers and spinach or kale (fresh or frozen.) Leeks also freeze well, chopped raw in a bag, they can keep a month or two but then may start losing flavor. Easy Storage Tip: Fridge. Sweet Potatoes — 2-3 pounds — Yields were low again this year. We’ll keep trying new tricks, but growing this southern crop up north is only worth it cuz they’re so darn good. We’ll have them clean and dirty, your choice. The clean ones are reliably good for two to three weeks. The dirty ones will store longer, maybe 1-2 months. Easy Storage Tip: Basement, 60°, if it’s not 60 then eat within one month. Dried Herbs — Your choice of 2 bunches — Oregano, Thyme, and/or Sage. Usually we do 3 bunches, but these didn’t thrive this year. Kale — We’ll have some in the barn but there’s still a little more out there, help yourself! At this point you can pick every single leaf, literally, there’s no need to leave the small ones since we usually till it in before snow covers the field; this year that job might have to wait til spring though. For herbs, there are a few tiny remaining sprigs of thyme, oregano, and sage. Brussels sprout picture contest! — We enjoyed hearing that our brussels stalks were part of at least a couple halloween costumes, and now we want to see more! Send us a picture before New Year’s of your stalk being put to its next use — we’ll choose one winner to receive a $15 credit towards our bulk produce, cookbooks or reusable bags. We reserve rights to use all submitted pictures to make us look good. Bring a Sturdy Box — If you like, a box or tote may be the best way to carry this share to your car. It’s a lot of food, and heavy. Much of it is already bagged for you, but it is several bags, plus the loose crops. We’ll have a few paper bags but if you have some it’s a good idea to bring those too. We can help you carry or roll it (or sled it) to your car if you like, feel free to ask. Hard Cider Tasting! — Our friends Nate Watters and Tracy Jonkman, and their brewing partner Jim Bovino, of Keepsake Cidery are celebrating the launching of their new orchard and cider facility with a cider tasting and tour — this Sunday Nov. 16th from 3-5 pm, at the orchard / cidery in Dundas. The address is 4609 135th St E. Dundas, Mn 55019. They will be sampling last year’s experimental batch of hard cider, drinking fresh juice, and touring the new cidery and orchard. Plus they will be having a fundraiser, think of it as a face to face kickstarter, with gifts for donations. RSVP soon to keepsakecidery@gmail.com, there is a limited amount of space left! Storage Share Pickup Hours — THIS THURSDAY, November 13, 10:00-6:00pm. Call or email if you can’t make it and we’ll make arrangements with you. Here are 2 new recipes. We’ll have a couple pages of other great “keepers” too, available in the barn. 2) In a bowl, toss the beets with 1/2 Tbsp olive oil to coat. Spread in a single layer on a baking sheet. 3) Mix the remaining 2 Tbsp olive oil, garlic, salt, pepper, and sugar in a large resealable plastic bag. Place the sweet potatoes and onion in the bag. Seal the bag, and shake to coat vegetables with the oil mixture. 4) Bake beets 15 minutes in the preheated oven. Mix the sweet potato mixture with the beets on the baking sheet. Continue baking 45 minutes, stirring after 20 minutes, until all vegetables are tender. 2) Put brussels sprouts in a large bowl. Add oil, rosemary, salt, and pepper and toss together. Transfer to a roasting pan and cover with aluminum foil. Roast for about 20 minutes, until just tender. 3) Remove from oven, discard foil, and sprinkle shallots over sprouts. Roast for an additional 15 minutes. Remove and let cool. 4) To make dressing, combine oil, vinegar, maple syrup, water, cayenne pepper, and salt in a blender and blend until smooth. Transfer to a bowl, add parsley and thyme, and whisk together. 5) Combine brussels sprouts, apple slices, cranberries, and almonds in a large bowl. Add dressing, toss together, and serve.